Limburg has very complicated history. The present (Dutch) province of Limburg was only partly governed by the counts of Limburg. The main part of Limburg is the present day (Belgian) province of Limburg. The arms of Limburg are a red lion on a silver shield. The arms are known since 1208. In 1221 the lion got two tails as the then count was also count of Luxemburg. The arms haven’t changed since. 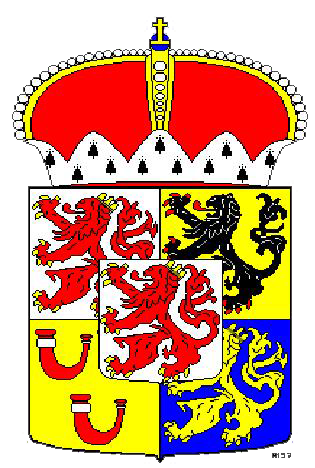 The provincial arms show the complicated history with the first quarter being the arms of Valkenburg (a county in the southern part of the province), the second Gulik (a county which owned part in the middle of the province), the third Horn (a county in the western part), and the fourth Gelderland (the northern part) and over all the original arms of Limburg.